Advanced Fantasy Baseball: Fuentes to Twins, Rodney to Close, Walden the Future? Fuentes to Twins, Rodney to Close, Walden the Future? The Los Angeles Angels have sent left-handed closer Brian Fuentes to the Minnesota Twins for a player to be named later. Fernando Rodney will assume the closer role for the Angels. Fuentes will see some save chances for the Twins but as their sole healthy left-hander, Fuentes will often be used in platoon situations. "He'll be setup and probably occasionally close if I use [Matt Capps] too much," Gardenhire said. "He gets lefties out pretty [darn] good, plus he can close, too, another very, very good arm out in the bullpen with experience. He should help us out." The Angels insist that trading Fuentes does not indicate they are giving up on the season. They're right, it doesn't. But it is a good move for a team with little chance of winning and a bullpen loaded with younger and superior talent. It also helps that the Angels are expecting a very good player in return. Angels general manager Tony Reagins said the club will "soon" receive a "prospect with upside" as part of the trade and thanked Fuentes for his two seasons with the club. It's still unknown how much of Fuentes' salary will be picked up by the Twins, as there is $1.89 million left on his contract this season. Reagins and Angels manager Mike Scioscia said the move doesn't indicate they are giving up on this season and building for next season, as veteran reliever Fernando Rodney will serve as the club's closer the rest of the season, and young relievers Michael Kohn and Jordan Walden have impressed so far. Walden, who has received a lot of attention lately for his gun-busting fastball, is a future closer candidate. He has awesome stuff but failed to develop as a starter. He is now considered a full time relief pitcher by the Angels. According to the Los Angeles Times, Jordan Walden has reached as high as 102 mph with his fastball. Fantasy owners should hang on to Brian Fuentes if they are still in need of saves. Fuentes may not get many but his overall numbers should improve as he becomes more of a platoon specialist. Fernando Rodney may be available in shallower leagues and is worth picking up for those in need of saves. Rodney is also the likely closer to start the 2011 season as well. 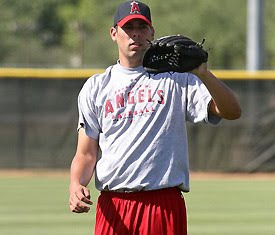 Jordan Walden has a bright future in the Angels bullpen and I see him becoming the full-time closer in 2012. He is an excellent speculation pick for those in re-building mode.